Great presentation @ Corey's last week Thanks. I'll keep you and your Dad in my prayers. What about cold temperatures? Personally, if I don't keep my throat covered below 50 degrees, it affects my sinuses, which affects my throat. What about singing or speaking out in cold, wind, rain, etc? 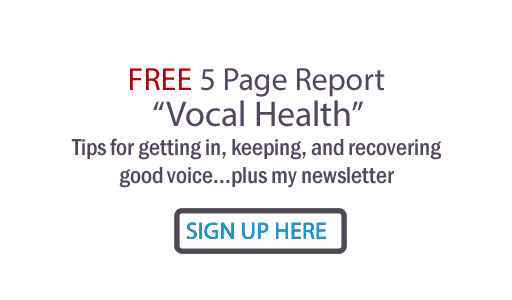 Yes, singing in conditions that lead to sinus issues and then on to throat/laryngeal inflammation definitely would contribute to vocal strain. I'll be posting about this, thanks for the suggestion, Kyle! Judy, I'm shocked (and disturbed!) at how many of those points hit home with me. Just a quick run-through of the ones that definitely affect me... bad breathing technique, tight throat channel, acid reflux, talking too loud, muscle tension problems, fatigue problems, posture issues, emotional problems, lack of sleep, dehydration, and a flabby core (hate to admit it!). It's funny how you can see things with blinders on--thinking that just one or two things are the problem, when it's really a plethora of issues. Almost the entire article applies to me. I wish I was independently wealthy so I could come to Nashville and let you take me on as a pet project! lol :) You'd have me whipped into shape in no time. But I DO have your CDs, and I finally do have time off from work in November and December, so I am committing to working with your CDs daily and I will keep you posted on my progress. Exercise and meditation should help with the posture and tension problems, and eating healthy will help with the acid reflux (that is an occasional problem and I avoid the foods that cause it). Lack of sleep is one that I'm currently tackling, and I need to drink more water because I know I'm chronically dehydrated! Lots of things to put on that daily list, but I am ready. I'm planning to put my first singles and/or EP out via www.Kelley-Online.com in 2010, so there is no excuse for being lazy about this. I need my voice to be in its best possible condition. Kelley, your upcoming CD project is a GREAT reason and stimulus to get you working on your voice. I look forward to your progress as you do get serious about it... and your better health, as well! I am a new singer and experience scratchy throat after I sing even when I warm up and stay hydrated. What am I doing wrong?